PASCAGOULA, Miss., Aug. 29, 2005 (PRIMEZONE) -- U.S. Navy sailors Thursday began moving aboard LPD 17, the first San Antonio-class amphibious transport dock ship built by Northrop Grumman Corporation (NYSE:NOC). This activity is a significant step in bringing this modern, highly technical asset to life as part of the nation's defense plan. 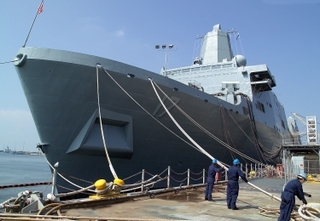 Northrop Grumman Ship Systems delivered the LPD 17 to the U. S. Navy on July 20. The LPD 17 design includes advances such as enhanced survivability, state-of-the-art command-and control capability, automated systems, modernized mission stations and enhanced ergonomics, which greatly improve the quality of life at sea for the sailors and Marines. With these advances, the LPD 17 class is the most sophisticated and survivable amphibious ship ever produced, and as such, offers unparalleled amphibious war-fighting capabilities. "There are many milestones we chart and observe during the construction of U.S. Navy vessels," said Bat Robinson, vice president and general manager of expeditionary warfare programs for Northrop Grumman's Ship Systems sector. "But the crew move-aboard milestone ranks as the most significant because those men and women wearing U.S. Navy uniforms now have a place to call their home. We've made great strides in providing a ship that offers more sailor-friendly features than any ship in the history of the Navy. The attention to human-factor designs and quality craftsmanship displayed by the shipbuilder's of Northrop Grumman will allow these sailors and Marines to perform their duties of defending freedom in a more modern environment." "The first thing I noticed was the wider spaces in the passageways and ladderways," said Montrell Dorsey, a second-class gunner's mate on LPD 17 who served on prior LPD-class ships. "It's so much easier to move around, especially if I'm carrying equipment. But it's even better for Marines because it gives them the ability to move forward-to-aft quickly, which is important in crisis situations. "And, we love the sit-up racks because they give every sailor the opportunity to have privacy and the ability to read or work in their own space," he continued, commenting on the racks' individual lights, ventilation and writing surfaces. "This is the most sailor-friendly ship I have served on and it gives me great pride to know that a company headquartered in my home state has built and delivered such an outstanding vessel." "There is a brand new shine in the crew's eyes this morning being able to move aboard this ship," said Navy Cmdr. Jonathan Padfield, prospective commanding officer, San Antonio. "We are now breathing life into this ship and the crew is thrilled and very proud to take on the responsibility of getting her ready for sea. San Antonio will be sailing as part of U.S. interests for many years to come and the crew is proud to lead the way. We're grateful to Northrop Grumman and the LPD 17 industry-team members who have allowed us to get to this point and we can't wait to get started. This is now our home." The LPD 17 ship class ships are 208.4 meters (684 feet) long, 31.9 meters (105 feet) wide, and will replace the functions of the LPD 4, LSD 36, LKA 113 and LST 1179 classes of amphibious ships. This new ship class affords the Navy's Expeditionary Strike Group the technology and flexibility to launch and recover amphibious landing craft such as the Landing Craft Air Cushion, operate an array of rotary-wing aircraft, as well as the ability to carry and launch the U.S. Marine Corps' Expeditionary Fighting Vehicle.